What kind of dog bed does your furkid sleep on? If you are like many pet parents they either have a crate or a soft basket type bed tucked away in a corner some place. However, an increasing number of dog owners are opting to offer their pooch an elevated bed to sleep on instead. When many people hear about elevated dog beds they assume they must be for elderly or sick pups. Or for little doggos only. However, neither of these things is true. Opting for an elevated dog bed offers all kinds of benefits for both pups and their pet parents and they are perfectly suited – when sized right – for large breed dogs as well as small. The difference between the support offered by a standard dog bed and elevated dog bed is like the difference offered between a bed’s mattress and a kid’s bean bag chair. And be honest, is a bean bag chair ever comfortable to sleep in, even to doze, when compared to your nice comfy bed? Of course it isn’t. An elevated bed offers even, firm support – just like a good mattress for a human bed – which is not the case for the floor of a crate or a soft dog bed. This is obviously much healthier for a dog already suffering from joint issues (as many older dogs do) but it’s also far comfier for any pup, even a very young one. Because air can flow under the bed, it helps keep pups cooler in the summer and warmer in the winter. This helps them get a better sleep and for dogs who have a tendency to overheat easily – like bulldogs – ot can make a huge difference to their everyday life in the summer. Dogs who like to chew things usually LOVE to chew their beds, which often means even the most expensive of standard dog beds becomes nothing more than a pile of stuffing and some torn fabric in a matter of weeks (sometimes even less) A raised dog bed has no stuffing – although a stuffed topper can be easily added if you so desire – and is crafted from sturdy, durable materials that are much harder to mangle, meaning that such beds stand a very good chance of surviving even the most voracious of chewer’s assaults! Because they are very basic, and many of the best of them fold easily, a good raised dog bed is both easy to clean – many can be wiped clean with a damp cloth – and easy to carry. This means that when you head out into the sun to enjoy some time on a sun bed your pup can too! Once you begin to shop for an elevated dog bed you will find that there quite a large number to choose from. So what should you be on the lookout for? Durability and high quality craftsmanship is a must, especially if the bed is for a larger dog. The legs should be sturdy, the bed should be ‘rated’ for your dog’s weight and the fabric of the bed platform itself should be sturdy without being too rough. Height is also a consideration. If your furkid is small, or is older and not as agile as they once were a bed that is raised to high from the floor will be hard to get on and off, and they may even hurt themselves trying to so so, or at least become so frustrated trying that they refuse to use the bed at all. All of this can be examined in person if you are purchasing the bed in a physical pet store, but we all know that it is often easier and more convenient for pet parents to shop online. If you are taking that route read all of the product specifications carefully – especially when it comes to weight capacity – and take a few minutes to read some of the customer reviews, things that usually offer lots of insights. You should also make sure that there is a return policy in place, so that the bed can be returned fairly easily if you so run into problems. As we know it can be confusing, being faced with all those choices when all you want to do is find a nice, comfy bed for your pup, we took the time to take a look at a lot of them for you. Here’s a look at those we were most impressed with, for both smaller and larger dogs. Here’s a quick look at the our best elevated and cooling dog beds comparison table for small to medium sized dogs, followed by our reviews of our top picks. 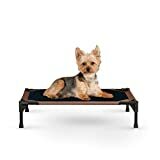 This sturdy cooling bed is available in several different sizes, but the small sized version measures 17″ by 22″ and it stands 9 inches off the ground, making it perfectly sized for most toy and small breeds. The good news is that it can also support a lot of weight – up to 150lbs, so for pet parents of heavier smaller pups it is still a viable choice, they don’t have to feel stranded in the middle of a bed that’s way too large for them. The K & H Elevated Pet Cot comes in different sizes and was originally designed for camping and travel, and its durable mesh fabric upper is both sturdy and waterproof. It comes assembled out of the box – a bonus for those of us who are sometimes construction impaired – and it weighs just just a few pounds so is lightweight enough to be reasonably portable. Those pet parents who have purchased – and liked this bed – comment often on how impressed they were with its durability as well as the fact that their pups seemed to take to it right away, even those who seemed a little skeptical of the height at first. This small dog bed – it can comfortably and safely accommodate up to 45lbs – is designed to be a little longer than some of its competitors so that there is a little more room for pups to stretch out. The small size – the version reviewed here – measures 26”L x 26” W x 9” H so there is indeed lots of space for you pup to move about on. In itself it looks very much like a dog camp bed, and that is, in many ways pretty accurate. Its double crossed leg construction makes it very stable and it folds up easily, making it an excellent choice for travel. It is the ease of use and portability of this bed that many pet parents appreciated most, but some do report that it has seemed to help alleviate joint pain in their older dog. Most of its fans also liked the fact that it could basically be wiped clean with a damp cloth and would look nice and clean again with ease and that the fabric – which resembles that which is used to craft higher end tents – survives even the odd sharp claw or two. But don’t just take our word, go here to check all customer reviews on the Amazon. Another offering from K&H Pet this is a canopy that is designed for use with the cot we b began this list with. 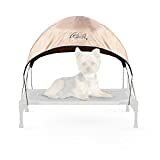 The addition of this canopy basically turns your pup’s new bed into a canine sun lounger, allowing them to enjoy time outside in the sun with everyone else without becoming overheated. Secured with bungee straps to the cot this is an extra that any pet parent should consider if their furkid will be hanging out outside in the sun, but for some breeds, breeds that overheat easily, such as bulldogs and pugs, this can be a real game changer. Often these pups have a hard time being outside for longer periods of time at all, but thanks to the fact that the canopy keeps them cool and shaded they get to snooze in the sun with everyone else a little while longer. Those who enjoyed this purchase praise it for the fact that it does a great job of keeping their pup cool and that it assembles – and disassembles, very easily. If you’re interested, check out K & H Pet Cot Canopy product listing on Amazon to check out customer reviews and the latest price. An elevated bed for a larger pup needs to be even more durable, in most cases, than one for a smaller dog. It’s imperative that it can hold the right amount of weight comfortably and that it provides the support that a larger pup needs. 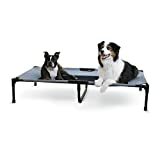 With all of this in mind here are our choices for best elevated or raised dog beds for large breed dogs shown in this comparison table followed by a review of our top picks. The Kuranda Dog Bed is one of the best selling elevated dog beds of all, despite the fact that it boasts a price tag that is considerably higher than some of its competitors. The bed comes with the claim that it is chewproof, something that the pet parents of voracious chewers probably doubt a considerable amount. However, according to the many five star reviews this bed has garnered it does seem that it does indeed live up to its promise, and a number of pups who have destroyed every other bed they have ever been given are still sleeping comfortably on their Kuranda Dog Beds months, and even years later. There are two different versions of the bed available, one designed for indoor use and one, crafted with an aluminum frame, that can be used indoors and out. This is, it should be noted, not a lightweight bed and it does require some initial assembly that is more involved than some of the other beds we have reviewed. However, most pet parents seem happy to trade off that small amount of extra convenience for a comfy bed that lasts. As for the price, you’ll find a good deal on Amazon – for your convenience here is a direct link to the Amazon listing. If you are looking for a lighter-weight, easier to transport large dog elevated bed option than the Kuranda then the Coolaroo is an excellent choice. It has a mesh, breathable fabric top but, according to reviewers it is still very durable, although not quite as tough as the Kuranda. But it is easy to assemble, lightweight and travels well, and unless you pup is a serious chewer it should prove to be long lasting as well. Fans of this bed praise its apparent comfort, its durability and how easy it is to clean and maintain. Many also love the fact that it seems to keep their pups so cool (living up to its name). If you’re looking to buy this particular Coolaroo pet product then go here to see the latest price on Amazon. The K&H Pet Cot returns to our list as a top choice for large breed dogs as well as one of out top picks for their smaller brethren, and for many of the same reasons. The largest version of the bed is designed for BIG dogs, as not only is weight rated to 175 pounds but it is also generously sized, measuring 32″x 50″. It is still raised just 9 inches from the ground however, so that it is still easy for larger dogs to get on and off safely and easily. The biggest fans of this bed are the pet parents of older, less mobile dogs who heap praise on it for being a bed that seems to help ease joint pain and provides their pup with excellent comfort. Many also report that despite being very lightweight, it’s surprisingly tough. But don’t just take our word, go here to check all customer reviews on the Amazon. There are some great raised dog beds out there, and some great options on our list. The ‘winner’ however, for both large and small breed dogs is almost certainly the K&H Original Pet Cot. It offers everything that pet parents look for in a bed for their pup and its pricing – especially considering its apparent longevity – is very reasonable.